The bookstore, located on the first floor of the Lane-Thomas Building on KCC’s campus at 450 North Ave., Battle Creek, will accept the shoes through the end of the month during regular business hours, which are 8 a.m. to 5:30 p.m. Mondays through Thursdays and 8 a.m. to 4:30 p.m. Fridays. This is the second consecutive year the bookstore has held the Sneaker Collection, which in 2014 yielded approximately 90 pairs of gently worn shoes for donation and another four or five dozen unusable pairs for recycling. The Sneaker Collection initiative corresponds with the store’s annual Spring Sale, during which all KCC clothing and gift items are 20 percent off for the entire month. It’s just one of the major donation drives spearheaded by the bookstore each year, which also include an annual Hoodies for the Homeless campaign. The latter involves the collection of gently worn sweatshirts for those in need each December, and has resulted in the donation of more than 300 items over the course of the stores 2013 and 2014 campaigns. 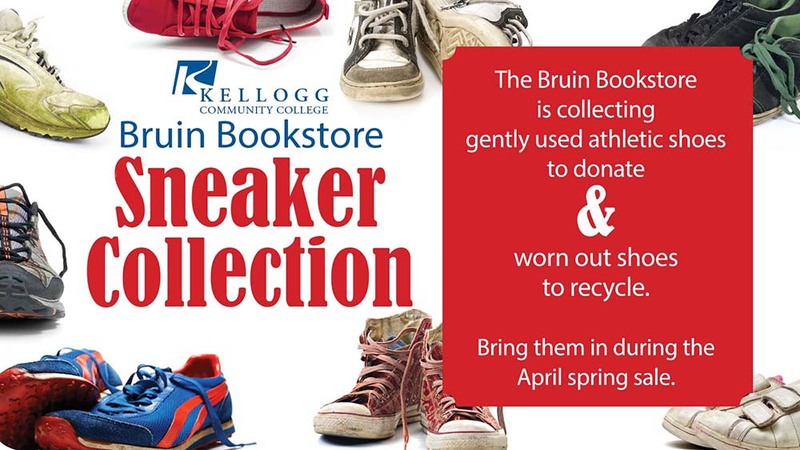 For more information about the KCC Bruin Bookstore’s Sneaker Collection campaign, the Spring Sale or other KCC bookstore initiatives, contact the bookstore at 269-965-4128. General information about the Bruin Bookstore, including key textbook dates for students, is available online at http://bookstore.kellogg.edu/store1/home.aspx.